Junior Ilani Williams-Harris. Photo courtesy of McIntyre Imaging. The Girls Basketball team (6-3) picked up their third straight win and moved to 2-1 in Circle City Conference play with a 61-47 win over Guerin Catholic HS on Saturday afternoon. Junior Ilani Williams-Harris buried six 3-point shots on her way to a game-high 20 points. She also tallied five assists, four rebounds, and two steals. Freshman Samara Douglas recorded a double-double, scoring 12 points, grabbing 10 rebounds, handing out 6 assists, and tallying 3 steals. Junior Sania Borom was close to a double-double as well, scoring 8 points and grabbing 8 boards. Sophomore Bonnie Ludlow chipped in 17 points and 6 rebounds as well. The Lady Warriors jumped out to a 13-8 lead after one quarter, but the Lady Golden Eagles stayed close through the first half, trailing just 31-26 at halftime. 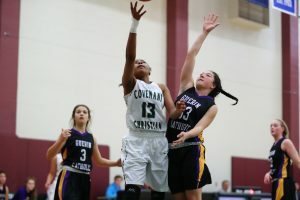 Covenant pulled away in the second half, building as big as a 22-point lead late in the game. Covenant will be back at home three times this week, as they host CCC and City power Heritage Christian on Tuesday night, and then Cathedral HS on Thursday night. The Lady Warriors will also host Linton-Stockton HS on Saturday afternoon at 12n/1:30pm.